One day when I was venting to the hubby and some friends out of my many frustrations someone said, “You started one event, why not start another?” Within an hour I had 20 volunteers, without even asking for them. Every time I would tell one person what I was thinking of doing and what I wanted this new event to be like, people would just ask if they could be involved. I feel so blessed to have these kind of people in my life! We intend it to be kid friendly event. I went through 10 years of fertility treatments and planned them all around the burns. Now that we have our daughter we will not go to an event that doesn’t allow her. We are raising the next generation of burners, we are trying to raise cool people. The event will be held in July, after Preheat and Serendipity. 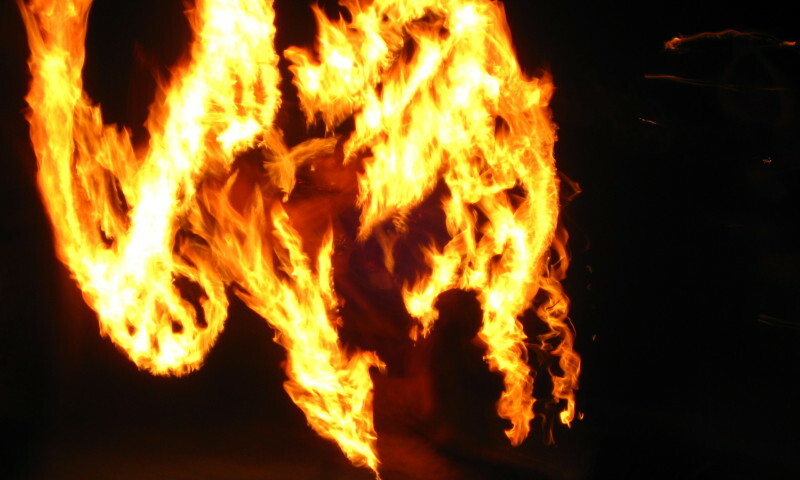 Florida En Fuego is a Burn event in North Florida in the spirit of the 10 Principals of Burning Man. Held in July each year which celebrates Art, Music, and Community with a Family Friendly All-Inclusive Ethos. We are Dedicated to maintaining a Safe and Fun Environment where everyone is accepted. A shared philosophy permeates every aspect of our culture. This ethos is the living heart of our community, our conscience and our collective memory. Outlined in the Ten Principles but more fully revealed in our actions, it informs all that we do. For our culture to survive and flourish we must continually work to nourish these core values. We refer to this ongoing mission of stewardship and scholarship as the Philosophical Center. They were crafted not as a dictate of how people should be and act, but as a reflection of the community’s ethos and culture as it had organically developed since the event’s inception. It is our hope to diversify this event with burners from all over the country. We have leadership people from Serendipity (Kive), Transformus (Phyrebolt), Apogaea (Rachel Cain), Love Burn (Prosperity), Preheat (Scotty), (Tom, Dasiy) and many more, Ignite, Alchemy, and our Pyrotechnics crew are San Francisco burners that run the pyro in Black Rock City. We even have Cedar one of the founders of Afterburn on our advisory committee. We have an LLC Florida en Fuego. The web team is working on our website, floridaenfuego.org & floridaenfuego.com. All we need is to choose the location. We have a few options. We would like to do more community outreach. We would like to dressing up in our burn gear with all our crazy colorful hair, go to the kids cancer wards and bring them colorful wigs to wear and dance in the halls. Show them that they can have fun wearing crazy hair. We will be going to arts schools and giving supplies to the students, like laptops to graphic designer students, knives to culinary students, instruments to band students. Help bands, dance teams and the like to go to competitions. My favorite thing about going to pizza parlors was all the happy faces covering the walls that were sponsored by the place. I want our website filled with people we have help or sponsored to come to the events. I have heard a lot of feed back from the community and we have many ideas. First we want to put on our website three touring art projects and their budgets; All the things they need to bring the projects to our event. We will put donate buttons on them and that will be how the community votes on which ones we want to come to our event. When we get half the money needed we will match the funds and bring it to our event. We want to do a burner exchange program with other people from other events so we can learn how the other communities do things. We want to make a database of artist that everyone can contribute to. We want community input. Your likes, your dislikes, what artists who you want to see at the event. We will have a monitored page to start a snark free dialog about the kind of event you want as a community. We will be posting events to meet up and do good works as a community on the events page. We will be asking for your thoughts on our rules, regulations, procedures, policies, and penalties. We are looking forward to making a great event together with all of you! this is just awesome 🙂 lets do this! !